Silicides of the rare earths, such as Tb, Dy, or Er, are known to form a variety of two-dimensional epitaxial layers on Si(111). Such film structures can be prepared by deposition of thin rare earth films on clean Si surfaces and thermal treatment. Depending on the rare earth coverage, submonolayer, monolayer and multilayer silicide structures are formed [1,2]. The monolayer and multilayer films consist of hexagonal silicides and are characterized by a two-dimensional metallicity . This work is currently supported by FOR 1282 project D and FOR1700 project E2 of the Deutsche Forschungsgemeinschaft. STM images of two prominent submonolayer structures, the chain-like 5x2 (left) and 2√3x2√3 (right) reconstructed Tb silicide structures . 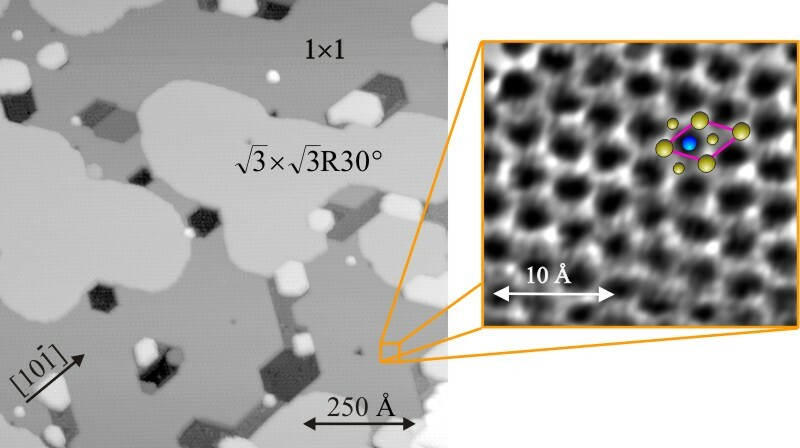 STM image with the 1x1 reconstructed hexagonal DySi2 monolayer and the √3x√3 reconstructed Dy3Si5 multilayer (left), and an atomically resolved detail of the DySi2 monolayer (right) . 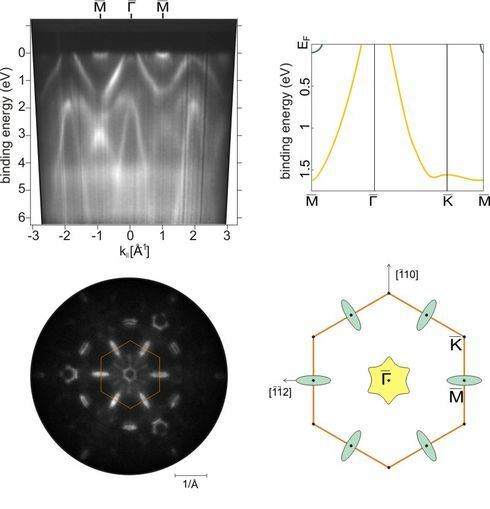 ARPES data (left) showing the electron energy dispersion (top) and the Fermi surface (bottom) of the DySi2 monolayer and the respective schematic representations (right) . Terbium induced nanostructures on Si(111), M. Franz, J. Große, R. Kohlhaas, and M. Dähne, Surf. Sci. 637-638, 149 (2015). Atomic structure of thin dysprosium-silicide layers on Si(111), I. Engelhardt, C. Preinesberger, S.K. Becker, H. Eisele, and M. Dähne, Surf. Sci. 600, 755 (2006). Energy surfaces of rare-earth silicide films on Si(111), M. Wanke, M. Franz, M. Vetterlein, G. Pruskil, B. Höpfner, C. Prohl, I. Engelhardt, P. Stojanov, E. Huwald, J. Riley, and M. Dähne, Surf. Sci. 603, 2808 (2009).